At Mohawk Trail Regional School, we believe fine and performing arts are important parts of the curriculum. Even if our students don’t go on to become professional artists, musicians, or actors, we’re confident their exposure to the arts at Mohawk opens their minds to the beauty our world has to offer—something that will stay with them for a lifetime. All students must take at least one arts course to fulfill their graduation requirements. 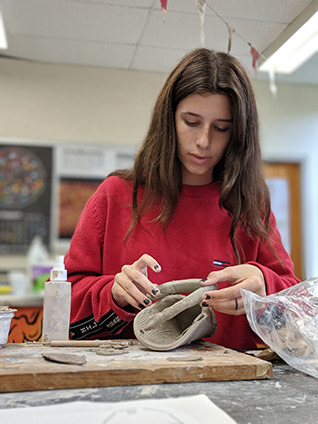 The arts enrich our lives in many ways, and our visual arts program offers students opportunities to explore creative expression and practice the principles of possibility. At Mohawk, our integrated learning opportunities encourage collaboration amongst multiple disciplines. Our middle school arts integration teacher regularly works with other classes to help bring content to life through art. Our woodworking program offers students authentic learning experiences using professional tools and quality materials. Two pathways are available in the program: the trade pathway and the arts pathway.